It was a starry night to remember as the winner of the ‘Miss Teen Universe India 2019’ was crowned in Noida Film City on December 18. 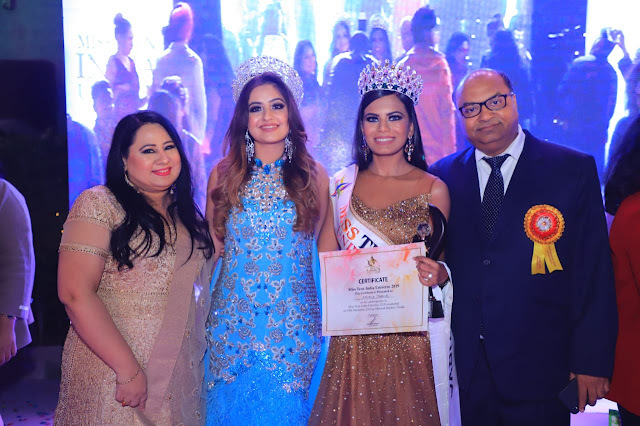 The event was organised by Jasmeet Kaur (National Director of Teen India Universe), in association with KG Maheshwari (owner of clothing brand Kiasaa) and Srishti Kaur, who had already made our country proud by winning the title 'Miss Teen Universe 2017' with her wit, charm and intelligence. This year’s crown goes to Apurva Pravin Thakur, who hails from Mumbai and is currently pursuing Bachelor of Architecture from Thomas Jefferson University Philadelphia. 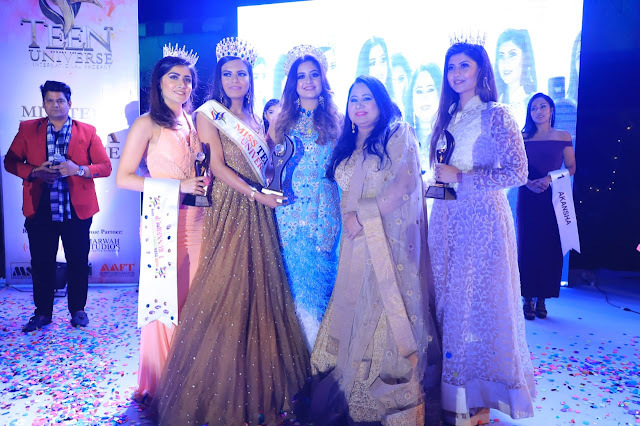 Competing with beauties from over the country, Apurva won hearts and was crowned in Noida’s Marwah Studious by the previous year’s winner Srishti Kaur. From evening gowns to Indian couture, the contestants walked the ramp with full confidence and pride under the immense guidance and mentorship of Melvyn Noronha. The event was graced by Mr Sandeep Marwaha, Director of Asian Academy of Film and Television and Asian School of Media Studies. He is also the founder of Noida, Film City. Recently, Srishti turned the showstopper at the ‘Heart and Soul - Women with Spirit Awards’ and pledged her support to the fashion show 'Cotton is Cool' campaign. The Delhi-born young diva is also an ambassador of the Indian cancer society, a philanthropist and an active participant of tree planting campaigns. Srishti also has another social initiative ‘Apna Ghar’ in her kitty, which is a school for the children of financially weaker section. 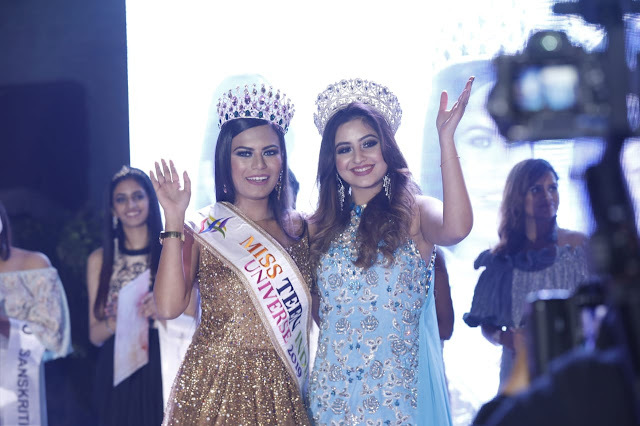 Srishti became the first teenager from Asia to ever win the international pageant. Srishti beat 25 contestants from across the world to win the pageant and is included in the list of Top 30 under 30 young achievers by Hindustan Times. Srishti also has a boutique jewellery and accessory brand Eliferous, which is already getting endorsements from prominent designers such as Manish Malhotra and Ritu Beri. This year’s winner Apurva, who floored the judges, has now advanced to the next level of the competition and will be representing our country in Panama (USA) for the most sought-after title. Besides, Palak Kholi from Delhi bags the first runner-up, and the second runner-up title was bagged by Chavi Mehal of Delhi. The event witnessed an awe-inspiring opening dance act on ‘Ganesh Vandana’. After which, the finalists were given a chance to introduce themselves in front of the spectators. Finalists proved their mettle by facing tricky and brain-twisting questions from the panel of eminent judges including Dr. Rita Gangwani (Retired Lieutenant) who is considered as a well-known Personality Development Mentor, Aarti Kapur (Co-founder and director of Marigold Naturals), Tammana Singh (MD of Uberlux India), Sharmila Jethmalani (Chief Stylist – Network 18, CNN-IBN), Asma Gulzar (renowned fashion designer) and Television celebrity personality Rapper Maddy (MTV Spiltsvilla contestant). The teens came from various social, geographical backgrounds which includes Apurva Thakur (Mumbai), Neel Anjana (Delhi), Palak Kholi (Delhi), Saniya Arora (Noida), Nritya Akansha (Delhi), Samiksha Ingle (Aurangabad), Jahnavi Rishitha (Delhi), Chavi Mehal (Delhi), Megha Dass (Delhi) and Sanskrit Sharma (Delhi). The finalists were selected from pan-India on the basis of an online audition. The evening also witnessed a stellar performance by Rapper Maddy, who had hosted UTV Bindass Yeh Hai Aashiqui Season 3 in 2016 and participated in the Splitsvilla season 10 in the year 2017.